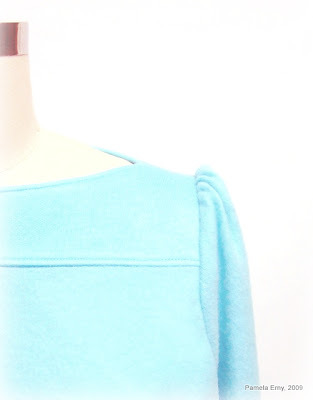 The Riviera Annisette Top is one of my favorite styles from HotPatterns, and a perfect style to demonstrate how manipulating the shoulder seam allowances can change the look of a garment with a gathered sleeve. This is a revised post (with some new information) of one I first published here in 2009...for my newer blog followers or those who may have missed it the first time. This is one of Hotpatterns' earlier styles, and it's on Clearance Sale at www.HotPatterns.com ...but I am not sure how long it will be on sale or even still available. I am not affiliated, just a big fan. 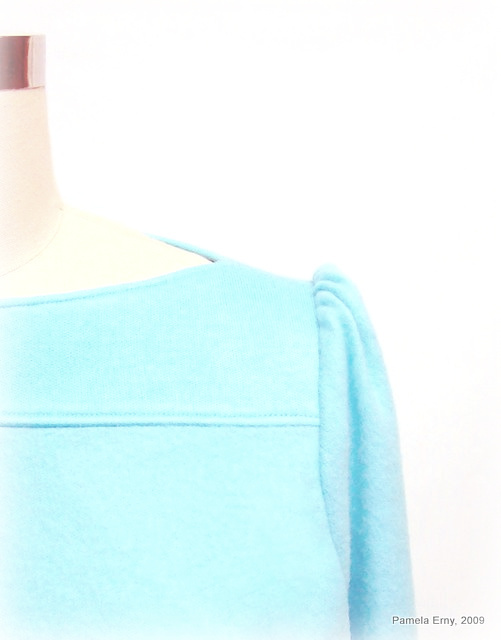 When the seam allowances are pressed towards the sleeve, you have puffy sleeves like the example to the right. Directing the seam allowances of gathers one way or the other can make a difference in other areas of a garment, as well. For instance, pressing the seam allowance of a gathered skirt of a dress "up" towards the bodice will encourage the gathers to lay more flat, in smooth folds. Pressing those same gathers "down" (towards the hem) will encourage them to puff-up. The same applies with sleeves gathers at the cuff....pressing the gathered edge towards the cuff will result in a smoother look, while pressing them "up" towards the sleeve will give the gathers a more pronounced puffy look. It's all about what you want and prefer. So remember...despite what the pattern directions say, you do have a choice!